Hi….I wanted to make sure to tell you upfront that the some of the products mentioned in this post have been received for free for evaluation purposes. With that being said rest assure that I only give honest opinions. The opinions are my own and always will be. Thanks for visiting. We had a BLAST! From the minute we walked in the front doors of the lodge our adventure began. We arrived about one hour before check-in. I told the kids we might not be able to register - that was not the case. The lady was extremely nice told me our room would be ready in a few minutes. She asked for my cell phone number so that she could give me a call when the room was ready. She also told me if we liked we could change clothes and enjoy the waterpark. The kids eyes lite up right away. We decided to spend our waiting time checking out the lodge. We took our map and found the inside and outside waterparks right away. Visited each restaurant and for sure checked out the gift shop. Within about 15 minutes my phone rang - the lady on the phone was very nice and informed me of our room number. When we opened the door to our room we could not have been more pleased! We had a family suite with fireplace. Perfect for this bunch! Living in Wisconsin you never know when you will need a fireplace. Sure enough the first night the temps dropped and we turned it on to warm up the room! Two queen beds ~ two TV's ~ couch ~ chairs ~ outside patio with table & chairs ~ fridge ~ Microwave ~ coffee pot .... lots of room! As you can see in the pic...Davey right away has his Wolf Ears on and he is changing his clothes for the waterpark! Caleb has picked his bed for the stay! Isa is in the bathroom getting her swimsuit on. For this stay each of the kids received a PAW PASS. I personality would recommend this for all families. PERFECT way to save $$$$ and control cost for your trip. There is so much included in the PAW PASS that all three kids were totally happy! YEP! ALL THREE! Ages 13 - 10 - 5!!! That is a feat in itself! The Paw Pass is a addon you can purchase for each child. 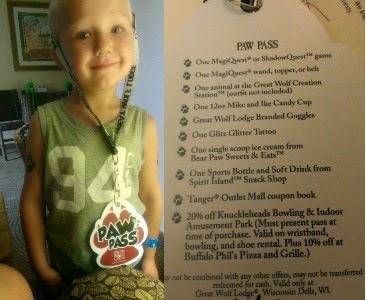 Great Wolf offers two different passes - PAW PASS and CUB PASS. 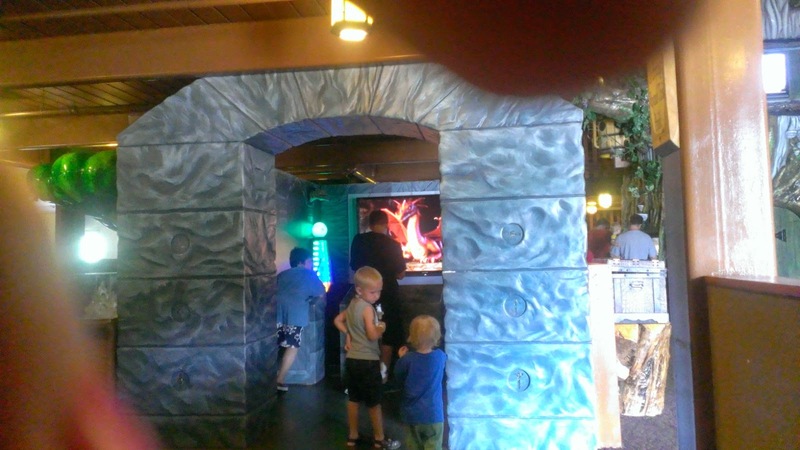 Their PAW PASS included......MagiQuest or ShadowQuest Game - Wand or Topper or Belt for the game - Great Wolf Creation - Mike & Ike Candy Cup - Water Goggles - Glitter Tattoo - Ice Cream - Sports Bottle with unlimited refills and discounts to two local attractions. The kids LOVED the PASSES! The passes were perfect for the kids....with the passes they did not ask for one thing extra. 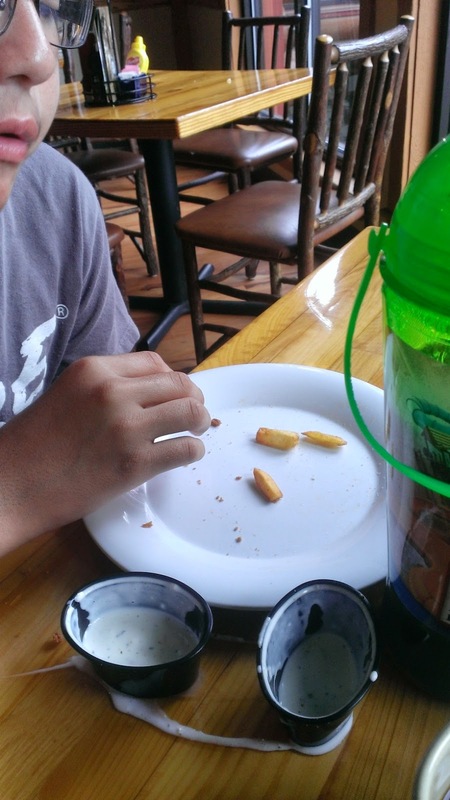 It was a good combination of items that keep them all satisfied. The Great Wolf Creature was a little young for Caleb - but he got one for his niece and the MagiQuest was a little old for Davey but he enjoyed every minute playing and with older kids...it was a total WIN!! WIN!! With me not having to say "No" you can not have this and "No" you can not have that all day makes for such a fun trip! Plus.....the PAW PASS saves about 38%! Which is awesome! Each park must have a different PAW PASS since our pass had two local discounts. When you check in make sure to ask about that locations PAW PASS...I know you will not be sorry! Waterpark here we come! The weather was beautiful the day we arrived so outside we headed! I am very very impressed with the amount of lifeguards and their dedication to ensuring every child is safe. They were definitely doing their jobs. Check out Davey with his new Great Wolf Lodge Goggles enjoying the water. When we got to the outside park Caleb & Isa headed to the slide. Isa stayed on the slide while Caleb found a couple of boys his age and they started to play basketball in the pool. What was so nice is that all three were able to find kids their own age to enjoy their pool time with. I joined Davey in the pool..we headed to the moving river - as we floated on our tubes ..I thought gosh this is really really fun! When I got out I sat in my lounge chair enjoying the warm sun while watching the life guards and the kids. I noticed they had a outside refreshment location.....a BAR! I thought a glass of wine would sure be nice. I got up and headed to the bar....sure enough they had a good tasting white wine in a neat plastic wine cup. Perfect for the pool! The wine was chilled and tasted very good. When the sun started to go down we headed inside! The inside is just as much fun as the outside! Totally different fun in the water! 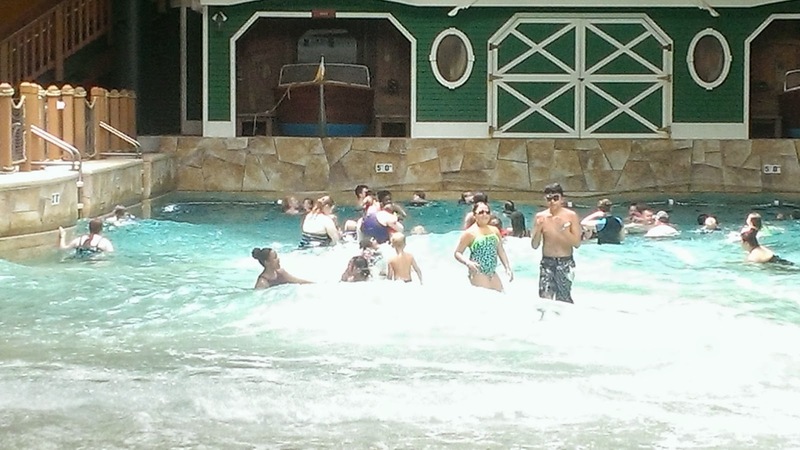 My favorite is the WAVE POOL...the WOLF started to HOWL and the WAVES started coming! FUN! idea what that meant. Once inside we were like "WOW" what a fun place! They each got a wand...since they needed a wand to play the games. MagiQuest is a video game that is played using a wand. The game is a series of task that are completed by finding objects throughout the three story maze. Caleb & Isa LOVED it! Davey had fun even though it was a little old for him..he still enjoyed it! There were kids his size at the game which made it nice for him. They also had tables and chairs where I sat watching Davey play the games. GOSH it was late and we had not eaten dinner! When we got back to our room we ordered a Pizza from the The Loose Moose™ Bar & Grill. Caleb & Davey walked to the grill to pick up the pizza. The pizza was tasty and very reasonable - We all had pizza for less than $15.00 - not bad! We slept great! When we got up and opened the patio curtains...it was raining! ICK! So we had a quick breakfast of cereal and headed to the inside park. The water bucket is really fun. There is a huge bucket very high up that fills with water...when it starts to make a clicking noise it is about to tip and dump the water on everyone under the bucket. Davey and I really enjoyed the bucket. It was also fun to sit and watch as others enjoyed the bucket water! SO much fun! Day two Davey meet new friends and also reconnected with his friends from yesterday. He was really happy! We keep checking outside for the weather to change...the rain had stopped and it looked like it was going to turn into a nice day. We had our fingers crossed because we all enjoy being outside when we can. Living in Wisconsin we had a terribly cold winter and it was a long winter. We want sun!! It was about 1pm when we decided to have lunch. Last night when Davey & Caleb picked up the pizza they said the food really looked good at the The Loose Moose™ Bar & Grill. We dried off and headed to the grill. We were all very pleased with our choice of food. 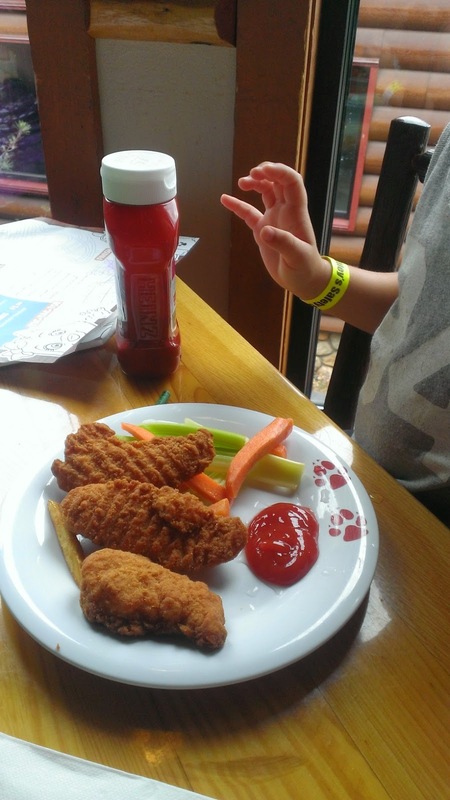 The kids all got Chicken Fingers..they had a good portion with drink for $6.00. 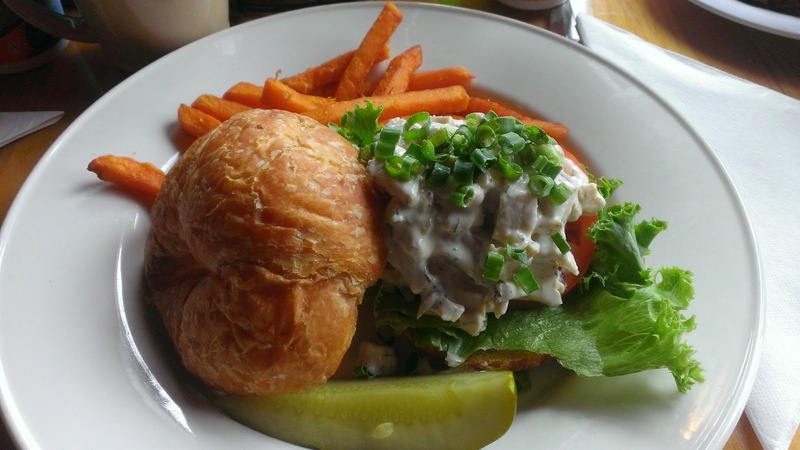 I ordered a tasty chicken salad croissant with sweet potato fries. Check out the pics. The food was very tasty - reasonably priced...we ate lunch for $30 - not bad! The best part is everyone cleaned their plate! We had a nice sit down enjoyable lunch overlooking the lodge grounds and watching the cloudy sky turn into a sunny day! When we finished eating we headed to check out if the outside pool was open! Outside water park here we come! Davey wanted to play basketball with Caleb. 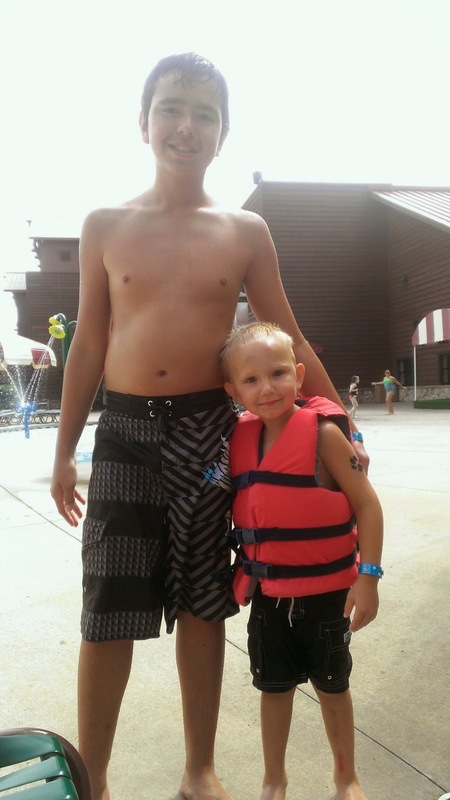 Great Wolf has life jackets available for the kids. Davey needed to wear a life jacket to play basketball since the water was 4-5 feet deep in that area. Check out their faces......13 and 5 years old. Both as happy as can be! In the background of the pic there are two children ...it is Isa and her new friend! We stayed outside till about 5pm - we dried off and headed back to the MagiQuest game. I was very pleased to find that their game was still good. No need to pay for today! That was nice. They played MagiQuest for about 2 hours then it was time to head out! What a fun time......as we drove out of the parking lot we were talking about when we should come back! Check out our souvenir ~~~~~ the perfect reminder of our fun trip! 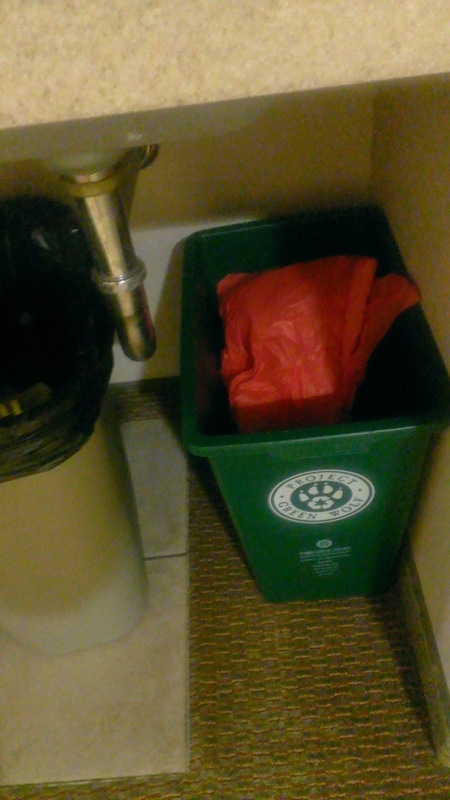 One of the best things about Great Wolf Lodge is that they are a Green Seal facility! 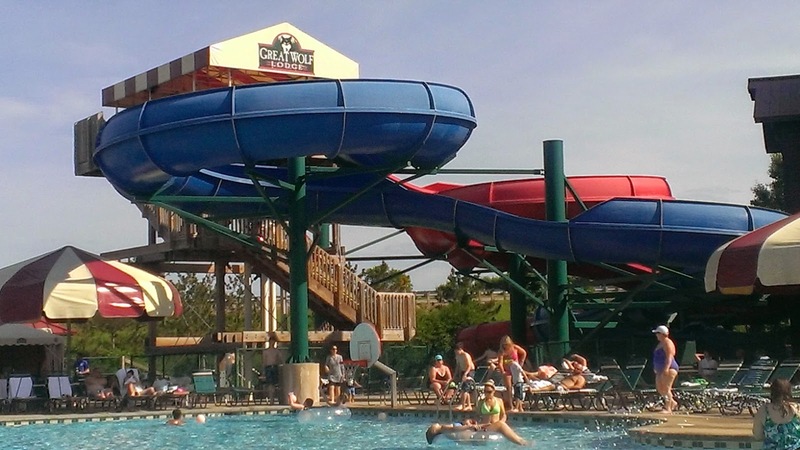 In fact they are the ONLY GREEN SEAL CERTIFIED waterpark! 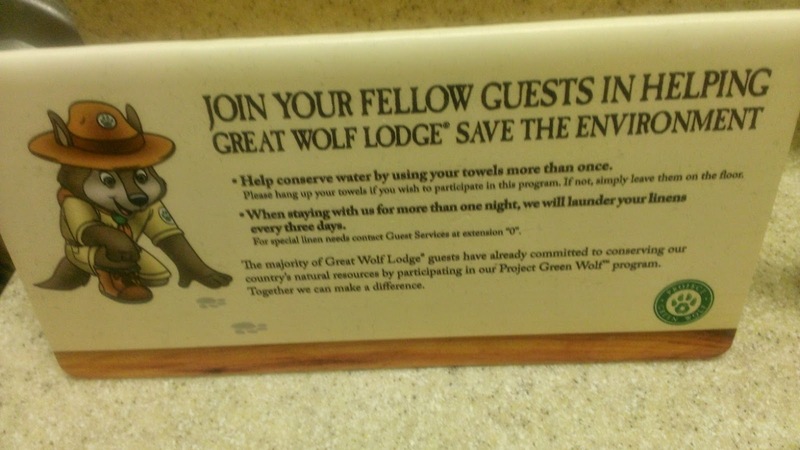 CLICK HERE to read about Great Wolf Lodge's GREEN PROGRAM! 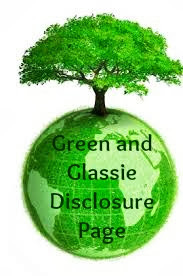 They CARE about our environment and are doing great things to make a difference! Recycle bin in each room...towel and linen program to save water. 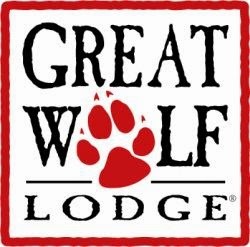 Make sure to check out the above link to find out all the ways GREAT WOLF LODGE is making a positive difference to our environment! We had a BLAST and we will definitely be returning! We had a HOWLING GOOD Time!!!! That looks like so much fun!! A GWL just opepend here in MA, but it's a good 90 minutes from me, so I am not sure if & when we'll be going. I had no idea there were Great Wolf Lodges all over the country. That is great to hear. If I ever get to Wisconsin i will have to pay a visit to the lodge. This is an amazing place. Looks like you all had such a nice vacation. Did not realize there was so much to do there. I must plan a trip soon. Looks like a fabulous place to visit! My kiddos would love a night at a motel and a water park! How fun! This looks like such a fun place to vacation with family. I have never stayed at a lodge before but this is the exact type of vacation I need! Great Wolf Lodge sounds like so much fun! And I love that they're Green Certified. Wow this place looks awesome! I'm sure you all had a blast! That wave pool looks like so much fun! We have one of these parks in Dallas TX. We have been waiting for our boys to get a little bit older so that we can visit. They are now 5 and 3 and I think they would have blast. This is on my bucket list to go to in North Carolina, loads of fun! Great Wolf looks like a lot of fun! Great pics! We have been trying to make it to Great Wolf lodge for two years now! It looks awesome!!!! I am so glad you all enjoyed your time! This looks like the perfect vacation destination for families. I hope to take mine one day! I JUST booked a stay for the family at the brand new Great Wolf Lodge in Boston. I absolutely cannot wait, especially after reading this post! 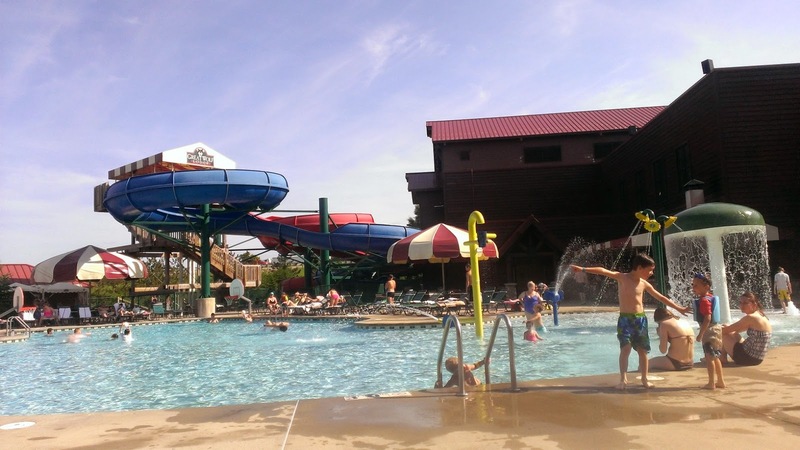 Great Wolf Lodge is so fun for families! We went over a year ago and my kids keep asking when we are going back! We just got back from the Grand Opening at GWL New England! I'm excited to be giving away a one night stay to a reader! Maybe one day we'll get to see Wisconsin! OMG- this looks like so much fun. We don't have children, but promised our niece and nephew we would take them this winter when it is cold and nasty outside. Seeing your photos makes me that more excited! 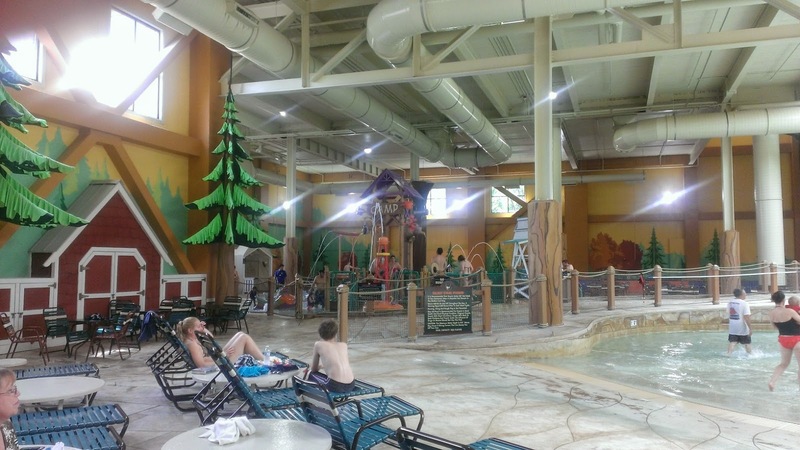 I was lucky enough to go to the Great Wolf Lodge in Wisconsin Dells quite some time ago so I don't really remember the experience that well but it sure does look like a lot of fun was had by all! This looks like so much fun!!!! Wow! There's so much to do there! It looks like a great place for a family vacation! Oh my goodness that looks like SO much fun! We have one around us here in Ohio, definitely making plans to go soon! 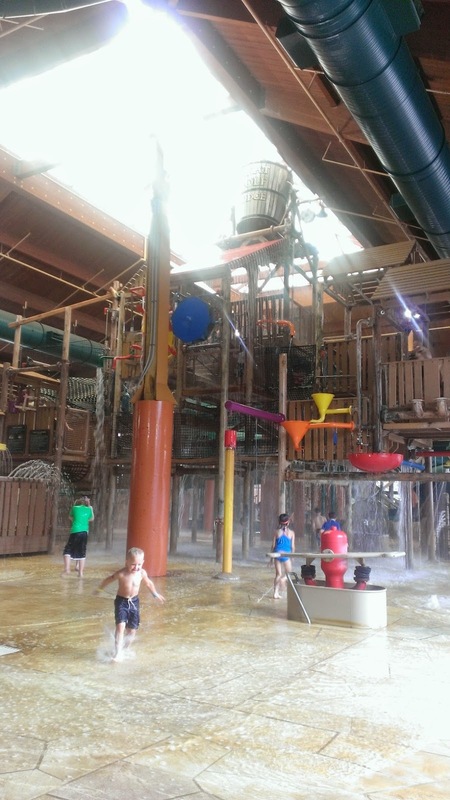 There is so much to do at Great Wolf Lodge! We have one about an hour from our house, but have never been. I've looked into a trip there, and I'm hoping we can make the trip this fall! 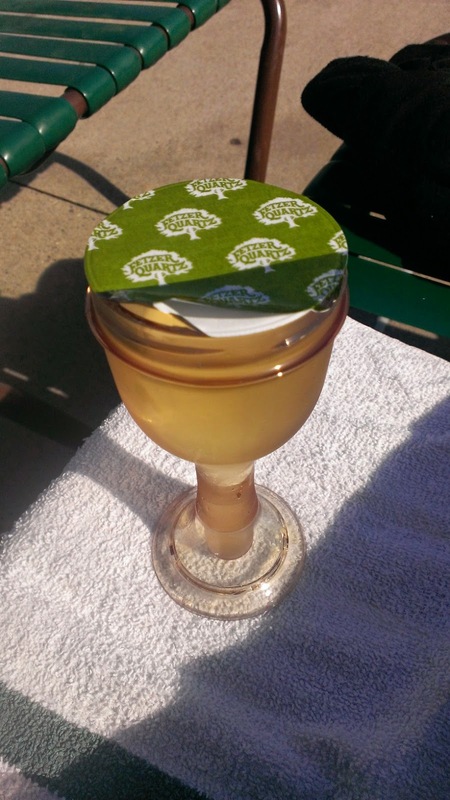 That wine in the plastic cup is pretty cool! This looks like a great place to stay with the family. Love that they have a water park! 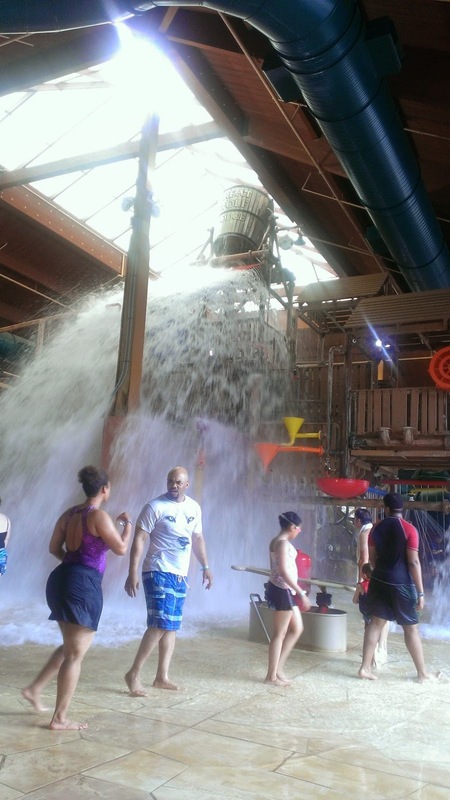 I so want to stay at the Great Wolf Lodge with the kids, they would love the water bucket dumping water on them. The food looks pretty good too. we have one in KC and it looks like a lot of fun. if i had smaller ones, we would definitely go! I went to a Great Wolf Lodge in Virginia just last month! I will definitely go back (or to another one). 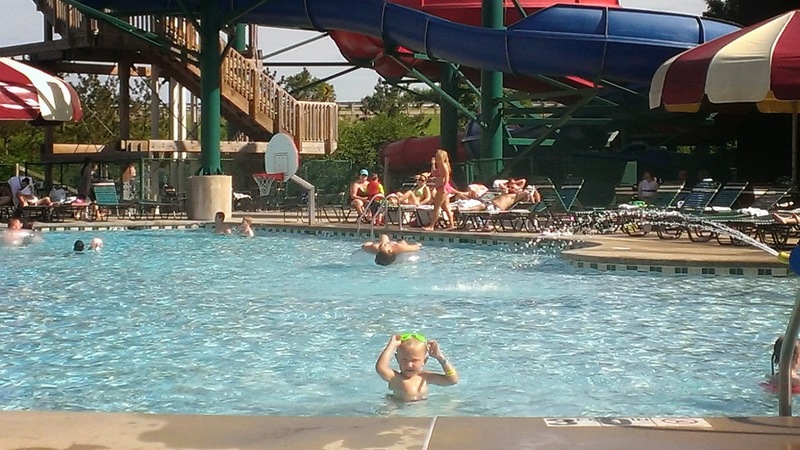 Like you, I was impressed with the lifeguards, and my son loved it. I've never seen shots of the outdoor water area so this is really fun to see! It's as cool as the inside! It's been a few years since we have been to Wisconsin Dells. I bet my girls would love to go back. 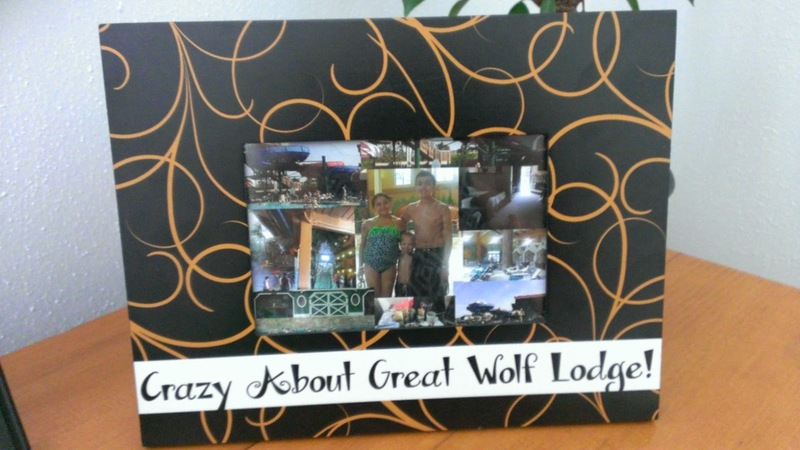 If and when we do, we will definitely look into staying at the Great Wolf Lodge! I've heard great things about Great Wolf Lodge. I would love to go one day with my kids. Thanks for sharing such a great review. 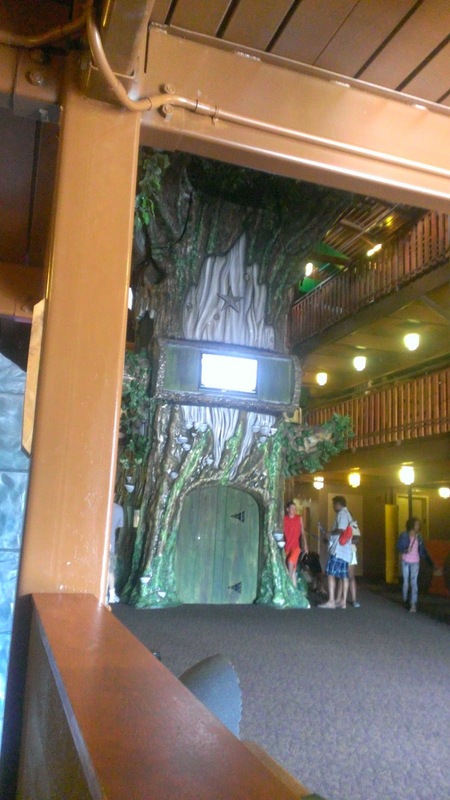 I have visited the Great Wolf Lodge in Kansas City. Hope to stay as a guest some day. Thanks!! We have a Great Wolf Lodge close to where I live. We've been meaning to find an excuse to head over and stay a few nights! I have been hearing a lot about the Great Wolf Lodge! It looks like a great place to take the family! That's a wonderful souvenir. I can't believe they can pack that much fun into one place and have such fun theming. Now that we're back in Chicago, I need posts like this so I have some ideas of what to do in the summer! This looks like a lot of fun, we'll need to schedule a trip. I've seen advertisements for The Great Wolf Lodge in NC and have wanted to go. If it's anything like yours I need to book my trip soon because that looks like a blast! Our kids loved Great Wolf Lodge! They did not want to leave and more then a month later my daughter is STILL wearing her wolf ears! Glad you enjoyed it! What a fun time! I have been to the one in Ohio and Traverse City and had a blast! I do want to visit the Dells too! Looks like you guys had a great time! What a fun time it looks like! I never been to one before. I love those water slides. Looks like the perfect place for a getaway! I have heard such good things about this place! Those water slides look like lots of fun! Oh this looks like a great place for me and the kids to relax. We have nothing near as cool as this where I live though sadly. I love Great Wolf Lodge so much. We've been to Charlotte and to the Poconos and had a blast at both. Oh I love this place! I haven't been for so long, but it was a blast! I have heard great things about Great Wolf Lodges. We hope to visit one sometime. Oh my kids would have a blast here. I'm sure they would love to go and actually so would I. Seems like a great place for family and yours seem to be enjoying it.